From 25th May 2018 new rules will be in place under the General Data Protection Regulation (GDPR) which expand on the current data protection laws we have today. Most processing of personal data by organisations will have to comply with GDPR by this date. The purpose of these new rules is to ensure that companies and organisations are open and transparent about the data they hold and what that data is used for. The regulations are also designed to encourage good governance over the use and security of data. In the UK, the Information Commissioner’s Office is responsible for overseeing this governance and they provide advice and tools to help organisations be compliant with this new regulation. 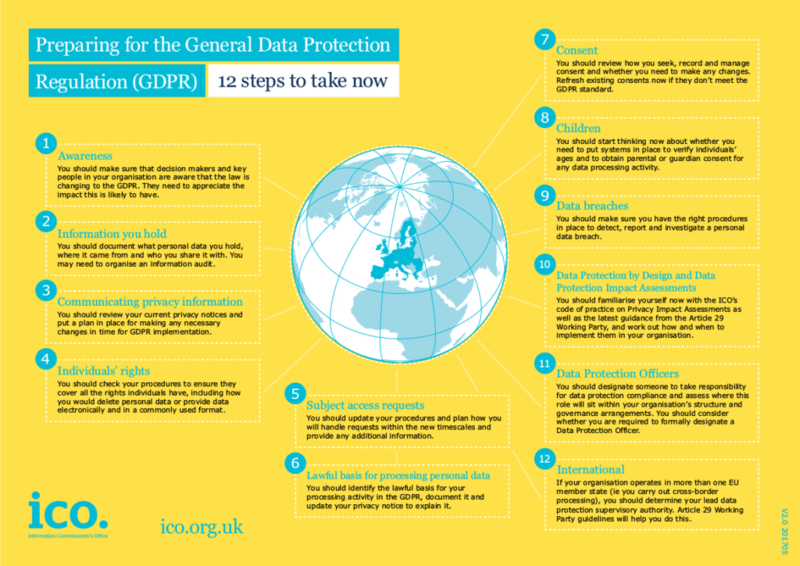 Below is a summary of the 12 steps to take towards GDPR compliance, and more information can be found on the ICO website at ico.org.uk. What does this mean for Digital Marketing? You may have a contact list full of customer details to which you previously sent out updates or alerted customers about new products or special offers. This list may become useless if you did not previously ask for consent via opt-in as you will no longer be able to send such updates to that list once the GDPR comes in. In order to continue to use customer details to send updates it is important that your customers are asked if they are content for this to happen, and keep evidence of them providing permission. Another part of Data Responsibility is the security of that data. Where is it stored? Who has access to it? How is data moved from one place to another? Around 70% of web traffic is now encrypted but there still remain websites that do not use https when handling sensitive data, allowing that information to be sent across the Internet in plain text where it can be viewed if intercepted. There are many factors to consider when looking to be compliant with Data Protection and this will vary a lot from business to business. What can teclan do for you?